Contact centers are obviously human-powered operations, and nothing is more core to the proper function of the operation than determining how many center agents are needed for a certain volume of contracts and more. if done well, the operation runs smooth, with the exact number of people available to respond to the expected workload. If done poorly, the organization is saddled with significant costs, both in customer dissatisfaction and in wasted payroll dollars. 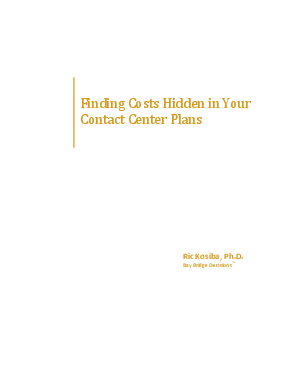 Read this white paper to find hidden costs in your contact center plans.